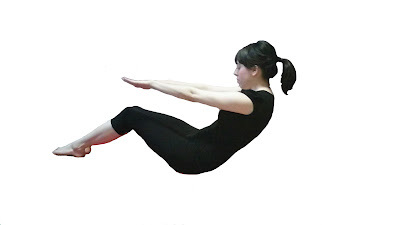 This exercise is a variation of the classic Pilates Roll Up. Bent knees takes the hip Flexors and hamstrings out of the exercise, so if either of those muscle groups were assisting you this is a harder version of the exercise. To do this exercise you will need a mat. Start by lying on your back with your knees bent and your feet flat on the floor. Allow your arms to be lengthened on the floor behind your head. Inhale in into the back of the ribs and then exhale as you articulate through your spine to a seated position starting with your head neck and shoulders. Once in the seated position then Inhale into the back of the ribs and exhale as you articulate your spine back to the floor starting with your pelvis. Repeat 8-10 times. If you have osteoporosis you can do this exercise with a neutral spine. Remember as you are hinging back from your pelvis to keep your spine at its longest possible length. If you are a person with tight hamstrings, this version of the roll up may feel much easier than others, but if you are a person that is recruiting the hip flexors to find the seated position then this exercise will be much harder. Have Fun!